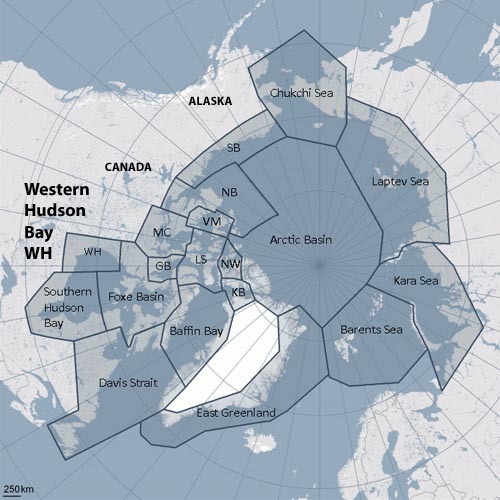 This media focus on Chukchi Sea polar bear numbers caught my attention because I had recently spent some time going through the 15 Polar Bear Specialist Group (PBSG) meeting reports in an effort to summarize the population estimates they provided. This international group first met in Fairbanks, Alaska in 1965 to advance and coordinate polar bear research and conservation under the auspices of the International Union for Conservation of Nature (IUCN) and the Species Survival Commission (SSC). I knew that according to the PBSG, the population of the Chukchi Sea is zero – that is, no Chukchi bears are included in the official total of 20,000-25,000 bears because no reliable survey had ever been done. Ovsyannikov’s statement to the press encouraged me to finish my summary of the population estimates in the PBSG meeting report tables. This was not an easy task, in part due to the virtually constant changes in presentation style and format in the tables used to present the data (which appeared first in the 1981 report). For example, even between the 14th (2005) and 15th (2009) meeting reports, the population data table presents the subpopulations in different order and swaps the position of two critical columns (“status” and “observed or predicted trend”), making it extremely difficult for readers to do a quick comparison between years. So I simplified the 2009 table (the most recent available), leaving out the future predictions as irrelevant to questions about current status. I included some population estimates and status assessments from previous reports to show the changes over time (where available). The full summary table, designated Table 1, is provided here as a pdf. [update 2013 – this is Version 3]. However, in this format, it still spans two pages, so I composed another table that contains the 2009 status information only (2009 is the most recent available), see Table 2, version 3 below. Viewing the data this way may surprise you. 1) All population size estimates are not of equal quality – some are based on aerial surveys or mark-recapture data but others are not. Some have no data whatsoever. 2) Both the “Status” and “Current trend” columns in Tables 1 and 2 are subjective assessments by PBSG biologists – this column reflects their professional opinion regarding the status of the various subpopulations listed. Although this fact is made clear in the text, it does not appear anywhere on either the 2005 or the 2009 PBSG status tables. Concerns such as documented or suspected over-hunting (including poaching) and out-of-date information are taken into account in these assessments. 4) I included only information presented in the original tables, summarized for clarity (except where I used the text to confirm or clarify table information, including the country where each subpopulation resides). provided by the IUCN Polar Bear Specialist Group. – Chukchi Sea has never had a population survey or a mark/recapture study (the population estimate is 0), yet the assessment for 2009 is “reduced” and “declining,” changed from “data deficient” for both in 2005. [see end of report “details” below]. Arctic Basin, East Greenland and Kara Sea have no data available data and all three have a population estimates of 0. – Gulf of Bothia is assessed in 2009 as “not reduced” and “stable” even though numbers have increased. – Davis Strait, Gulf of Bothia, Lancaster Sound and Norwegian Bay all had a population increase since the last survey: Davis from 1,400 to 2,142; Gulf of Bothia from 900 to 1,592; Lancaster Sound from 1,700 to 2,541; Norwegian Bay from 100 to 190. – Southern Beaufort, Western Hudson Bay, Baffin Bay, Kane Basin and Viscount Melville all had a population decline since the last survey: Southern Beaufort from 1,800 to 1,526; Western Hudson Bay from 1,200 to 935; Baffin Bay from 2,200 to 2,074; Kane Basin from 200 to 164; Viscount Melville from 230 to 161. In conclusion, it is apparent that the most recent subpopulation estimates for polar bears vary widely in reliability and accuracy and have done so both within and between subpopulations to varying degrees since the PBSG assessments began. Out of 19 subpopulations, four have no data and another four have inadequate data. Ultimately, the status and trend assessments reflect the opinions of PBSG biologists and are not necessarily based on scientifically-collected evidence. This may be the best available data but is it good enough to draw firm conclusions about the status of polar bear populations worldwide? Good question. In my next post, I’ll provide an example of a population estimate and status assessment from another closely related species, the grizzly bear. The 1981 report is the first to contain a population table with regional totals (plus two maps describing the boundaries of these regions), but the estimates in most cases are subjective rather than based on mark-recapture studies or aerial surveys. The total for all regions combined (not provided, calculated by me) ranged from 16,755 to 26,798 (based on minimum and maximum values provided). Many of the regions described in the 1981 report are not comparable to the “subpopulations” established in 2001 and used in the 2009 report. The 1988 report has no population status table. It appears that models capable of estimating the size of an entire subpopulation, based on survey or mark/recapture data from a portion of the total, were under active development at this time (Amstrup and Wiig 1991:11-12). By 1993, there is a status and population estimate table provided (pg 24) that approaches the modern (2009) form, but some subpopulations are still defined differently. There were only 15 subpopulations designated at this time. The total population estimate given at the bottom of the 1993 table is 21,470-28,370 (minimum vs. maximum estimates). By 1997, the PBSG present a table with 19 subpopulations (pg.25) but they are not quite the same as 2009. The “Status” assessment provided in the table is clearly described in the text as a subjective judgement (pg. 23). The total estimate given at the bottom of the 1997 table is 22,000-27,000 (the total of the minimum and maximum estimates) and only East Greenland is given a population size estimate of zero. It is not until 2001 that a table broadly comparable to the 2009 version is provided, although there are still 20 subpopulations listed (by 2005, the “Arctic Basin’ was merged with “Queen Elizabeth” for a total of 19). Also, in the course of renaming the “Svalbard” region to “Barents Sea,” a change was made in the boundary with the Kara Sea, which means that any population estimates for these two regions made prior to 2001 are not comparable to those made in 2001 and later. In the 2001 report, for the first time, the year that a population survey or mark/recapture study was done is included in the table. An assessment of the certainty of the population estimate is included (“poor,” “fair,” “good,” “unknown”). Some explanatory footnotes are also provided. The total estimate given at the bottom of the 2001 table is 21,500-25,000 bears (again, this appears to be a total of the minimum vs. maximum estimates as provided in the table), with two subpopulations given population size estimates of zero – Kara Sea and Arctic Basin. By 2005, for the first time, the status and population table (pg. 34-35) has no total listed and runs over two pages. Also for the first time, an “estimated risk of future decline (over 10 years)” is included, which is a computer modeled result (pg. 36, “subpopulation viability analysis”). There is another new category that is, like “status,” is a subjective (“qualitative”) assessment – opinions of the PBSG biologists (pg. 33) – “observed or predicted trend” (which appears to have been formerly included in the “status” determination). Whether a trend is “observed” or “predicted” is not indicated in individual entries. 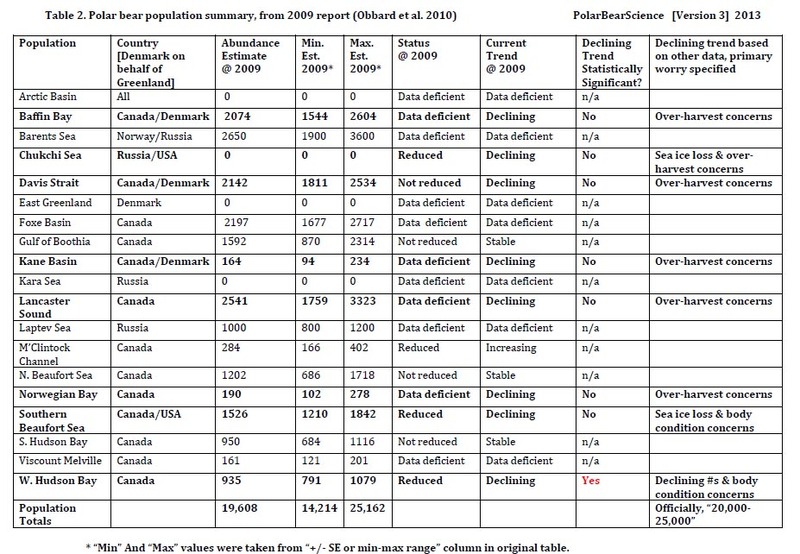 In the 2005 table, there are in many cases substantial notes attached to most entries (in a “comments” column) describing how population estimates and future trends were determined, or why no estimate is available. For the first time, an error estimate is offered for subpopulations that have aerial surveys or mark-recapture data (“estimate +/- SE or 95% CI” and “estimate +/- SE or min-max range”). Three subpopulations are given population size estimates of zero – East Greenland, Kara Sea, Arctic Basin. The total population estimate for 2005 given in the text is 20,000-25,000 bears (pg. 33). However, it is not clear how these figures are arrived at because as far as I can determine, none of the figures provided in the table add up to “20,000” or “25,000,” although a couple come close. As there is only one entry where a range of estimates is provided in the “number” column (Laptev Sea, 800-1200), I added up the numbers provided for “survey” data (taking the “Min” and “Max” values taken from the “+/- SE or min-max range” column in original table, which gives a minimum of 15,126 and a maximum of 25,757. So, for the first time, in 2005 the range for the total population estimate given is not the range of minimum and maximum estimated values but appears to be the range between the average and maximum values, rounded improperly [rounded to the nearest thousand, the range should be 19,000-26,000]. A strange way to do things but it may not mean much. Maybe someone thought “20,000-25,000” sounded better than 19,000-26,000? Perhaps 15,000-26,000 sounded too imprecise? By 2009, the population status table runs to six pages (62-67) and the subpopulations are listed in a different order than they were in 2005. The total population estimate is unchanged from 2005 (“20,000-25,000”) and again, this total is provided in the text only, not in the table. As in 2005, this estimate appears to be the range between the average and maximum values, not the range between minimum and maximum estimates. The figures I got were 19,608 and 25,162, which actually do round to 20,000-25,000. See Table 2 for a simple summary of the numbers by subpopulation. In the 2009 table, the column labelled “Current trend” appears to be the same as the column in the 2005 table that was called “Observed or predicted trend.” Regardless of the label, both are clearly subjective assessments (not based on models – there is a separate column for model-predicted future trends). Now, according to US Fish & Wildlife biologist Eric Regehr, a new survey in the Chukchi suggests this opinion may be incorrect, although the details are still unavailable, see my previous post. This entry was posted in Population and tagged Chukchi, IUCN, PBSG, Polar Bear Specialist Group, population size, SSC, status, trends. Bookmark the permalink.